what a FAB contest! Woot! Thanks so much Ami! You are in — and yes, there are THREE humidifiers (three winners) being given away. I just joined bTrendie. Looking forward to seeing what the site has to offer. My daughter would greatly enjoy a Sponge Bob Humidifier . . . Thanks ladies — if you rush on over to bTrendie.com I think they have one more day left on a $75 Birthday in a Box giveaway! My kids, especially the stuffy one, would love this. I joined bTrende, and I’ll be back later after I’ve tweeted and blogged. i already joined bTrendie…can i still be entered in the contest? Melanie (and other bTrendie members) — go ahead and tweet and/or blog about the giveaway (and let me know that you were already a bTrendie member) and you WILL be entered in the giveaway! I checked with our sponsor and that is fine — thanks for asking! My son has asthma and allergies, I think this might help him. I joined bTrendie. I already signed up for the Grandma’s Gift set! I love this humidifier! It would be perfect for my 3 month old daughter who suffers from allergies due to the dryness of our house. I joined! Thank you Kathy, Carol, Karen, Monique, Beth, Teresa, Jennifer, Deborah, and Rachel for participating! I’m so excited to see so many participate and thrilled that we have THREE humidifers to giveaway! This article would like to thank the person who shared with us. Use in research. Site yöntecilerine thank you. Just joined hope I am a winner! now a member of Btrendie. This is a great contest. just joined. 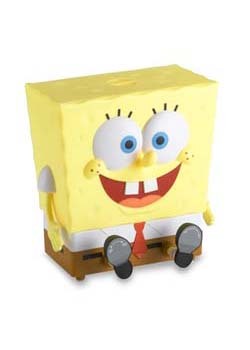 Spongebob is a cute idea for a humidifier. new member and the automatic shut off is a great feature. This sure would come in handy. Hope I’m one of the lucky winners. I joined – thanks for the giveaway! This is so cute! My daughter would be thrilled! I have joined bTrendy.com! Thank-you for the chance! Thank you Elizabeth, Sherry, Kathy, Georgie, Roxann, Amanda F., Letessha, Jammie, Angie, Sam, Marylou, Jarrett, Chuck, Alexis, Barrie, Tim, Angela, Kayla, Tim, Vinc, and Sharon! I wish everyone terrific luck!